In the background, a sign reads on two lines as shown below. A man and a woman are standing and looking at the sign. 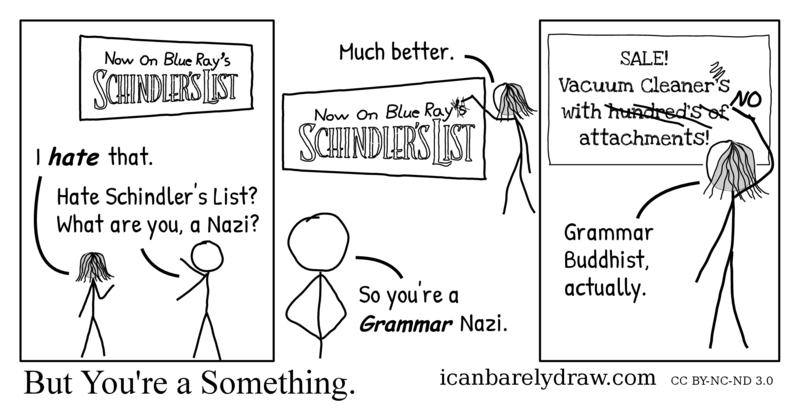 Man: Hate Schindler's List? What are you, a Nazi? In the next panel, the woman is holding a writing implement, and she has scribbled over the trailing apostrophe and s in the first line of the sign. Man: So you're a Grammar Nazi. In the third and final panel, a different sign is seen in the background. The woman is seen again with a writing implement in her hand and she has made corrections on the sign. The original sign reads: SALE! Vacuum Cleaner's with hundred's of attachments! The woman has crossed out the apostrophe in "Cleaner's" and has crossed out the phrase "hundred's of" and replaced it with a boldly written word: "NO". Title: But You're a Something.